A Little Analogy of Life and Work … Both Things are Deeply Connected! Hello, fellow “Netizens”! I have a special something for you today. It is a story, and a reflection on what we do in our daily lives, as it compares to our “Working” lives. Last Christmas I was blessed enough to be at home and doing a job for one of my old employers just to make ends meets. Now, another former employer of mine is in the same town, and a much bigger corporation, and the people there are still like family to me. 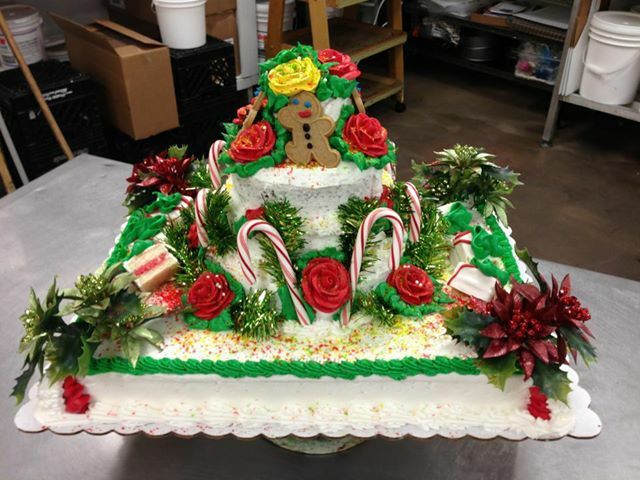 So, at Christmastime I made a special cake (I was working at Vowell’s Marketplace at the time) and delivered it to my friends and former co-workers at Taylor Machine Works. I had previously worked at Vowell’s when I was in college, and Taylor’s was the first job I had in the IT industry. Now, since I left my last position as IT manager, I had tried to go back to Taylor’s but they just don’t have any positions available. So I went back to work at Vowell’s to get through the holidays. Now I am actively searching for a new opportunity, and I hope this story I am going to tell will let any future possible employers know a little about me, and about how much I have learned in the (almost!) 20 years I have spent working with changing technology. I realized that many of the things we do in life reflect on what we do as workers, and I just wanted to share this with you. Now, the first thing I want to share is the parallel between making a beautifully finished cake product, and managing people who are software developers. From a Software Management viewpoint, with almost 20 years behind me, I want to put my experience to good use. I hope that I can find a place where my unique talents will be indispensable. But any good manager knows the resources he or she has intimately, and can “jump in” if needed, to do the grunt work. I find myself doing a lot of grunt work, but I hope to progress. I hope to find a place where all my accumulated experience will be more than beneficial. I’m turning 40 this year – I’m still a young man but I’m at Seniority level and I have the experience and perseverance to prove it. Just as in baking that perfect cake for friends and family, software development for the public use follows the same basic flow. Here is how it works. When baking a cake, the first thing you do is gather all your raw materials. Eggs, Milk, Water, Flour, Shortening, and any flavoring you want to add to make this cake special. You carefully pick the brands you trust, knowing they will give you the flavor you desire. In this one instance, though, let’s say I could not find the name brand of an ingredient, but I needed it all the same. We’ll take cream, for example. In all other cases you have used Borden’s Heavy Cream and it worked out perfectly. But there is none available. So you take a chance and use Luvel – a much smaller brand name but available. You mix all these ingredients into a smooth batter, and then you pour it into a greased cake pan. You cook your cake for the right amount of time (this is a very important time management principle – If you take the cake out too early it still be in it’s liquid state; if you wait too long, the cake will burn) and once that is done, you take the cake and freeze it overnight. This is done so that all the elements of the cake are at the exact same proportionate temperature, and it will physically behave like you want it to. You never want to ice a hot cake – if you do, it splits apart down the middle and you’re left with a mess to clean up! Once the cake has frozen overnight, you take it out and let it begin to thaw. Now, since the cake has been in a frozen state, the thawed state is the state that it will be consumed in. So basically, you are no longer worried about time constraints – other than you want to have it ready for consumption by the person you’re giving it too. But before you can give it to them, the finishing touches have to be made, in order to make it presentable. You have to ice the cake completely, leaving no flaws, and then you do a second pass with decorating tools to make the consumption of the cake by the person eating it a pleasant and enjoyable experience. Working in the Software Management industry is an exact parallel. You first find the best people for the job (ingredients). Sometimes you may see a resource that doesn’t exactly have all the “paper qualifications” needed for a job, but if you use a lesser known name brand (as we did in this step with the cream), you may find out that the overall texture and fullness of the cake is better than you had thought it might be. Blending the right people together you will get the perfect idea, and it will be something that almost everyone has a use for. Once you have established your idea, you actually start work on it. It is now a project. Project can be a scary word because it has “infinite dimensions”, some of which you won’t discover until you are working on it. That’s where management (the thing I am most capable of) comes in. Management can define all the dimensions needed, set a timeframe for when work will be completed on those dimensions, and work with the resources (ingredients) to maximize time spent on work done. In the Overall life cycle, once the idea has been brainstormed and the project has been created, then it is time (like the cake) to create your product. Your first draft product is just like the cake that comes out of the oven. You do not want to rush too fast without proper quality control steps, or your product will be faulty – either too “buggy” or with more features than the end user can deal with (“burnt’). Once you have your product stable, you give it a set amount of time and test it every way possible before you move on. Now, with the cake, at each step a person or two has stuck their finger in the batter and tasted it for quality – these are your Beta Testers. Their input at the right time, will make your product better. For Instance, if you need to add more cream, or more flavoring, you can. By following these parallel procedures, it doesn’t matter if you are making a cake or designing software – if you use the same processes, You will get the best result possible. And everyone knows (In my case, I love to cook, my Grandmother taught me how to make delicious food and cakes) the experience brought in to the project makes all the difference in the world. I am going to purposefully fall into an old cliche trap now, just because I’ve always wanted to say it. Creating software is just a piece of cake, when you have the right recipe to start with. Thank you all for the time you spent reading my analogy. I hope it makes sense to you. It will at least, give you a new viewpoint on something we do everyday – just from a different perspective. But we all know that “Perception makes Reality”. Now, for those of you who did stick by me for the whole analogy, here is a picture of the last cake I baked and decorated, then delivered to my friends at the company where I used to work. They were thrilled. My cake was a gift, but several of them ordered cakes from the store I was working at after the fact. And here, in all it’s glory, is what I dubbed, “My Christmas Gift to Taylor Machine Works, 2012”. I wish happiness and blessing and good fortune to everyone who reads this!